Hivi M240 is designed by professional engineer through precise calculating and adjusting, which is a continuation of M200 series of acoustical elevation structure. It guarantees the sound directly points to listener’s ears. The front plates incline backwards slightly and make a fiducial sound source with tweeter placement. 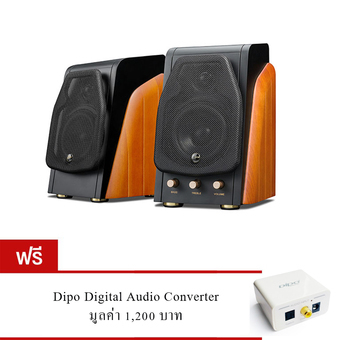 In this way, the speakers make it sure that the distance of high and low frequency is the same from listener. It can ensure the accuracy of sound phase and difference apart high frequency from low frequency in near-field listening. At the same time the irregular box structure can reduce the standing wave and restore a more clear sound. M240 is a blend of sligtness and luxry. Inheritated the noble style from M200 series, M240 has a more flexible and exquisite body, which perfectly suits for limited space. The fine wood panel with natural grain is carefully selected and manufactured. The case design effectively reduce resonance and enables the speakers to stay fluent even with high dynamic range music. The Bluetooth integrated in M240 give you a wireless Hifi time. It keeps the traditional balance input while adds 4.1 bluetooth function. It is with automatically switching function and Bluetooth signal input is prior to balance input. Mid-high range sound is determined by a tweeter. A voice and overtone of an instrument are closely related to a tweeter driver. TN25 is an classic tweeter with sweet, fine and bright sound. It is called “the king of the tweeter” among Hifi lovers. The 25mm tweeter that M240 adopts have been fully upgraded.